The Zinman Co, LLC has unveiled its latest product for LIVE entertainment and broadcast, “In Your Back Pocket”, a collection of 400 HD loops for LED screens, digital lighting and HD projection; pre-rendered for MAC and PC based media servers. “It’s not a replacement to your existing library, but a resource in your back pocket when you can’t find “that” clip in your existing library,” explains developer Michael S. Zinman. “We designed every clip to be easily keyed, tiled and colorized painlessly, we’ve also rendered many of these clips to play at a slower speed, as most media servers do a better job speeding clips up,” says Michael Zinman. “Everything about In Your back Pocket will make sense to programmers. 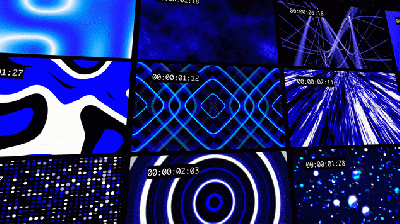 To our knowledge, this is the only collection of royalty-free loops that have been designed specifically for media servers, and the programmers who operate them.” All loops are categorized into 14 file folders, sorted by color; making it efficient to scroll through content by following along with the lighting designers color schemes. In Your back Pocket has pre-rendered the clips in either MAC or PC format so they just have to be ingested into a media server, saving hours of work. The original source files created in Adobe® AfterEffects® are provided for users that want to customize their loops, easily adding their own design styles. Users can modify or re-render any of these projects.